Android Distribution Updated for December 2016 – Nougat Hits 0.4%! The Android Distribution chart has been updated for December, detailing the huge jump in usage that Nougat has seen in the past month. Just so we’re all clear, that was a joke. According to the chart, Nougat is sitting at 0.4%, up from its initial launch on the chart of 0.3%. That’s a 0.1% jump. For more specifics, Marshmallow is up to 26.3% (from 24%). 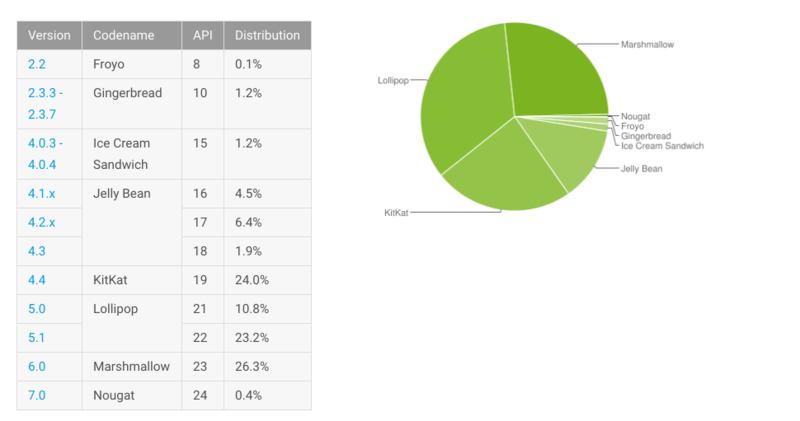 Lollipop dropped to 34% (from 34.1%), as did KitKat (now at 24%), Jelly Bean (now at 12.8%), Ice Cream Sandwich (1.3% to 1.2%), and Gingerbread (1.3% to 1.2%). Froyo remains on the list with 0.1% of the pie. November’s numbers can be viewed here.